Raising Charlie is on Amazon.com! There is no actual book yet that you could hold in your hands, but Raising Charlie is now available for purchase at Amazon.com. A representative from the publisher called me this morning to confirm a few details and within an hour, the book was available online. The thrill of seeing the book in an Amazon.com listing will not match the thrill of seeing the actual book, but after more than a year of work, it feels like a pretty big deal. I have already sold a few advance copies through my RaisingCharlie.com website, so the first books I receive will go to fill those orders. Now it's time to undertake some creative marketing to get the word out and get the sales rolling. Away we go! Our sailing plans for next spring have changed. Instead of sailing exclusively in the waters off Panama, we're going to be sailing from Panama to Key West, Florida. When John Kretschmer contacted me last week with updates for his website (http://www.yayablues.com), the number of berths available for the "Caribbean Circumnavigation Leg 3" had increased from one to three. This was the trip I had been hoping to go on originally, so I asked if he would consider a "two-fer" as part of our trade arrangement. He agreed. So next year, from May 1 to 15, we will join John and the rest of his crew on Quetzal, his Kaufman 47, to sail from Bocas del Toro, Panama to Key West by way of Nicaragua, the Bay Islands of Honduras, the reef and offshore atolls of Belize, and one of our favorite places, Isla Mujeres, a small island off the Yucatan peninsula across from Cancun. In fact, Nan and I are getting ready to spend a month on Isla Mujeres starting September 12. We'll be staying in the same penthouse apartment we stayed in last October, and the owners are letting our dog, Scout, stay there with us. 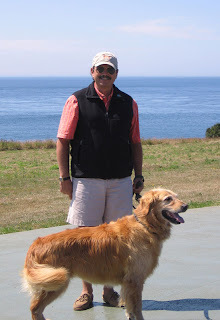 It will be Scout's first flight, and we're hoping it goes well because there could be many similar trips in his future. We have already gotten him a "puppy cut" to keep him cool and paid a visit to the veterinarian to get his rabies and bordetella boosters. In addition, he'll need vaccinations for hepatitis, pip and leptospirosis, which we will get on the Thursday before we leave since we will also need to get a health certificate signed by the veterinarian not more than 72 hours before we enter Mexico. There is a permit to purchase when we get there but no required quarantine period. When he gets off the plane, Scout will be just another happy tourist. While we're on Isla Mujeres, we'll be volunteering at an English school, tutoring children four days a week. This should help us with our Spanish, but we'll also be getting tutored ourselves three days a week. Nan came up with the idea to help our friends on the island, Juan and Paula, to write a cookbook, something like Tastes of Isla Mujeres, so we'll be working on that as well. By the end of our four weeks there, we will have a good idea of what it's like to live in a foreign country, which should be useful to us in our future adventures. President Obama came to Grand Junction yesterday, his first visit here since his campaign stop last September (Obama in Grand Junction). Last time, he was trying to win a close election. This time, he was trying to secure healthcare for all Americans. Nan and I entered our names in the raffle for tickets to the event, but we didn't win any. Apparently, whoever makes those choices does not cross-reference the donors database or we would have been in the stands at Central High School, "Home of the Warriors," with all the other Obama supporters. Instead, Nan convinced me that we should go and participate in the protests outside the event. 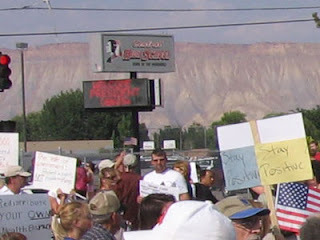 When we took a left onto Warrior Way, it was immediately apparent that the pro-Obama faction was on the left side of the street and the anti-Obama faction was on the right. How could it be otherwise? We followed the cars in front of us and turned left. A young man in a reflective vest had me roll down the window to inform me that parking on that side was for pro-healthcare reform people. I guess he thought we looked like an old conservative couple. Nan and I replied in unison, "We are for healthcare reform!" He waved us in. I have to hand it to the pro-Obama people: they are well organized. They had a flatbed trailer for people to stand on, a sound system playing happy rock-and-roll songs, plenty of pre-made protest signs, and a contingent of young people handing out water and reminding people to "Stay Positive!" 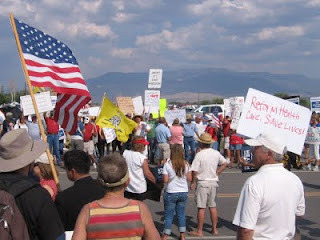 The other side of the street was not so well organized, but they did have "Don't Tread on Me" flags and a bull horn. One of their chants was, "We want our country back!" Like a smartass, I yelled back, "Where did it go?" It is obvious to anyone paying attention these days that the root of the controversy over healthcare is more about our African-American president than it is about the healthcare issue. 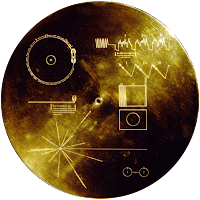 The "birther" and "deather" conspiracies clearly demonstrate that there are people who are unwilling to accept that things have changed. We saw a sign that was a parody of the Obama campaign "Change" signs. It said, "Rewind Change." I thought, "Sure, let's replay the previous administration's disastrous eight years. Is that what you want?" Me, I'm overjoyed that we now have an administration that cares about all of the people, not just the wealthy and the white. My gig maintaining John Kretschmer's website (http://www.yayablues.com/) is easily the best trade arrangement I have ever made. So far, it has allowed Nan and me to sail in the Spanish Virgin Islands this past April (see this blog's six-part series, "Sailing the Spanish Virgin Islands"). Next spring, it might allow us to sail in Panama. When John and I first started emailing back and forth with sailing ideas for next year, I suggested that if he had extra berths available for his May 1-15 trip, "Caribbean Circumnavigation Leg 3 - Bocas del Toro, Panama to Key West, via Nicaragua, Bay Islands of Honduras, inside the Belize reef and offshore atolls, Isla Mujeres", maybe that would work to satisfy the trade. He came back with the suggestion of a "two-fer," one berth in trade and one paid. That sounded good to me since we would be taking berths away from paying customers, but it would be dependent on availability. He would try to fill all the berths before offering them to us. Nan and I like to plan our trips well in advance, so the uncertainty of this deal was a concern. A few weeks later, John suggested that we sail in Panama instead. His sailboat, Quetzal, would already be there, in Bocas del Toro, the stopping point for "Caribbean Circumnavigation Leg 2". My immediate thought was that it would be fun to sail through the San Blas Islands and visit with the indigenous Kuni people, but then I looked at Google Maps and noticed that Bocas del Toro is more than 250 miles from the San Blas Islands. Under perfect conditions, that's at least two full days of sailing each way. Another look at Google Maps showed that Costa Rica, a country I've wanted to visit, is just 30 miles in the other direction. Maybe we could sail up the coast to Puerto Limón and Parismina, which is close to Parque Nacional Tortuguero. 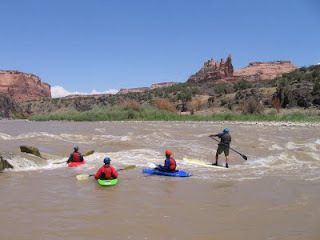 Yesterday I joined my friend Kurt Beereboom and the staff and students of the Aspen Kayak Academy (AspenKayakAcademy.com) for a trip down the Colorado River from Westwater to Cisco in eastern Utah, northeast of Moab. Kurt and I manned his sixteen-foot inflatable raft while everybody else paddled high-performance kayaks, except Andy, who paddled the entire distance standing upright on a paddle board. This was my first-ever rafting experience so I didn't know what to expect. I had done canoe trips in the Boy Scouts, but the rapids we negotiated then were ripples compared to what I imagined we would be encountering. I wasn't wrong. 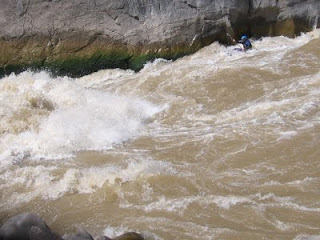 There were about twelve sections of rapids, and each was at least a Class III on the whitewater rapid classification scale, which goes from Class I to Class VI. The names say it all: "Staircase," "Funnel," "The Wall," "Sock-It-To-Me," "Last Chance." One of the principles I live by is to not participate in activities where a single mistake could kill you. So I don't paraglide, rock climb or kayak. I have known people who died doing each of those activities. Whitewater rafting is borderline. At a certain level, it's just a complicated way to drown. 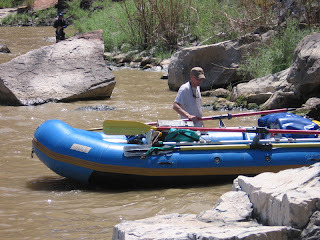 I would never sign up for a commercial rafting trip, but Kurt invited me to join him on his raft, with which he has several years of experience, on a stretch of river that he has done a few times before, with just the two of us on board. It sounded almost safe. The first photo shows Charlie MacArthur, owner of the Aspen Kayak Academy, taking a turn on Andy's paddle board, along with three of his teenage kayaking students, at the first of the Westwater Canyon rapids, "Little Delores." There is a standing wave there that Charlie and his students took turns "surfing" in their kayaks. On his first pass, Charlie did a jaw-dropping kayak move: at the point where the water dropped into the hole in front of the standing wave, he flipped the kayak over its bow in a cartwheel that landed him in the hole facing back upriver. He followed this with moves where he balanced on the crest and spun the kayak around in circles. When he tired of that, he flipped backward off the crest and came up facing downriver. Unbelievable. 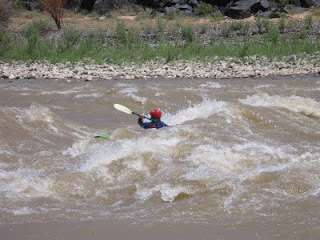 The third photo shows one of the students using excellent form to hold himself in the trough of the standing wave, which is flowing left to right. Click the photos for full-size views. The highlight of the day was the "Skull" rapids, an insane Class IV stretch that requires perfect maneuvering to avoid disaster. After passing the large rock on the left that marks the entrance, a boater must row strongly to the left to avoid a dangerously deep hole and then stay left to avoid being sucked into the "Room of Doom," a small natural cove with a perpetual whirlpool that makes it almost impossible to escape in a raft. 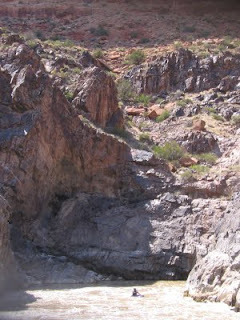 The fourth photo shows Charlie going the hard way, to the right of the deep hole and perilously close to the sheer rock wall. The final photo shows Charlie at the entrance to the Room of Doom, from which he successfully escaped. Of course. So how did I fare? I laughed like a soaking wet idiot through every rapid. It was a hoot!